New Year's Eve is a good time to reflect on the year just coming to an end, as well as looking ahead. First things first - I'd like to wish all of you a happy and healthy 2014, and to thank you for all your support during the past twelve months. For me, the past year has been a lucky one, with lots of interesting things happening. So today I'm going to indulge myself by recalling some of the crime-fiction related activities I've got up to in during the year - a reminder, perhaps, that one doesn't need to be a best-seller to enjoy the good life through crime writing. And I hope in the process of picking out some personal highlights to persuade myself that, despite relatively limited time spent novel writing. I've really not frittered 2013 away after all! 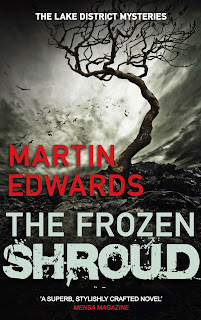 * The launch of The Frozen Shroud at Gladstone's Library was a trememdous evening in a truly atmospheric location. The reviewer reaction to the book has really gratified me. Plenty of people have said it's my best book to date. Whether that's so, I don't know, but I'm pleased that the result of my taking a slightly different approach to the writing process has gone down well. * Publishing Deadly Pleasures, the CWA's Diamond Jubilee crime anthology, was also very satisfying. It's a privilege to be the first person to read wonderful stories by the likes of Lindsey Davis, John Harvery, Ann Cleeves, and Peter Lovesey. * I was delighted that Arcturus reissued Yesterday's Papers as a "crime classic" and equally thrilled to find that their edition of All the Lonely People not only featured prominently in a display of classics in the British Library shop, but also earned a rave review in The Daily Mail, more than 20 years after its first appearnce. * Speaking of the British Library, I've enjoyed writing introductions for a total of three of their Golden Age reprints, to appear in 2014, along with an intro for an ebook reissue of a legendary American crime novel. I've also written essays for Morphologies, and for a crime reference book due to be published next year. * While I've under-achieved in terms of writing novels this year, at least I've produced quite a few short stories, including one inspired by a steam train trip to Whitby which appeared in Margot Kinberg's anthology, In a Word, Murder, and another inspired by a holiday visit to Grand Cayman, due out next year. * I discovered a fresh pastime as a tour guide, leading a group of international crime writers on a literary tour of Oxford. This led, quite unexpectedly, to a commission to write a crime story for a new international anthology which should appear within the next twelve months. * I was invited on to BBC Breakfast to talk about Agatha Christie, which was fun, and was interviewed on BBC radio about Broadchurch, the year's stand-out crime drama on TV. * Among other events, I took part in Gladfest, when Gladstone's Library proved to be the perfect setting for a performance of my Victorian murder mystery event. * Crimefest was, if anything, better than ever, and I enjoyed moderating the Forgotten Books panel as well as being a member of the team that won the pub quiz, alongside old friends like Kate Ellis and new ones like Alexandra Benedict. * This year saw the centenary of the birth of another notable Ellis, Ellis Peters, and I enjoyed taking part in the festival to mark the occasion. On the other other hand, I found it rather odd that the centenary of that great book Trent's Last Case was almost universally ignored. * The CWA Dagger Awards was an excellent evening, very well organised by Alison Joseph and Lucy Santos. I've now spent a year on the CWA committee - my colleagues are a really good bunch of people. * I've read some terrific books, old and new, during the course of the yeat - it's almost impossible to pick out a favourite, but Andrew Taylor's latest was definitely up there with the best. Alanna Knight, one of the stalwarts of British crime writing, has been awarded an MBE in the New Year's Honours List for services to literature, and her many friends and fans will be delighted that this prolific novelist, very popular both as an author and in person, has been recognised in this way. Alanna is, as this award illustrates, one of Scottish literature's leading lights. In addition to her many novels, she is a biographer and playwright and expert on the work of that gifted fellow Scot, Robert Louis Stevenson. As a crime writer, she is probably best known for her long series of historical mysteries featuring Inspector Faro,and I was very pleased a couple of years back when she agreed to contribute a Faro short story, "The Case of the Vanishing Vagrant", to the CWA anthology Guilty Consciences. Alanna has been a prominent member of the CWA for many years, and more than twenty years ago, she and her late husband Alistair organised a terrific CWA conference in Edinburgh. I remember that week-end vividly - it was great fun, and the Knights put a great deal of work into ensuring that everyone enjoyed themselves. My family and I have enjoyed her company many times since, and the Edwardses will certainly be raising a glass to her this Hogmanay. Endless Night, screened this evening on ITV, made an appealing Christie for Christmas. Agatha Christie's Marple is not an entirely consistent series, but here, the Queen of Crime's last really good novel was capably adapted by Kevin Elyot, who is a seasoned writer of Christie stories for stage and screen. Introducing Jane Marple into a story in which she did not originally appear was risky, for sure. Yet on the whole Elyot did a highly professional job - even though this did entail Julia McKenzie popping up so often and so unexpectedly that she became a spookier presence than the gypsy whose curse sets the story going. The brilliance of the original novel, lay in the fact that Christie, writing in the Sixties, repeated one of her most famous tricks, despite its being supposedly unrepeatably. I borrowed the book from the local library shortly after it first came out, and was much impressed. As a student, I also enjoyed the film version starring Hywel Bennett as Michael Rogers, the poor lad who marries a lovely heiress. The film's cast was superb - it also included the likes of Hayley Mills, Britt Ekland, George Sanders and Peter Bowles. I'd rate it as the most under-rated movie ever made of a Christie novel. Back to tonight's show, which also had an impressive cast. Tom Hughes played Michael, while his architect pal was played by Aneurin Barnard (the young hero of Moonfleet - he's had as impressive a festive season as Jenna Coleman.) Tamzin Outhwaite was almost unrecognisable as Michael's miserable mum, while there were cameo roles for Wendy Craig and Hugh Dennis. The unusual structure of the plot means that Endless Night is far from orthodox Christie fare. This has caused some commentators to under-estimate it. In fact, it's a good story, and although this version did not strike me as being quite as compelling as the film (though in saying that, I have to admit I've not seen the film for a very long time) nevertheless it made excellent Sunday evening entertainment. Moonfleet aired last night on Sky TV, the first of a new two part version of this classic smuggling story, written by Ashley Pharoah, best known for the brilliantly conceived time-travel cop show Life on Mars. With Ray Winstone his usual commanding self as pub landlord and contraband king Elzevir Block, it was a very entertaining show indeed. There's a suitably nasty magistrate, a forbidden love affair between the bad guy's lovely daughter and the courageous young hero, and plenty of dramatic action. You'd think it was based on a story written by Robert Louis Stevenson - but it wasn't. I first read - and much enjoyed - Moonfleet years ago, and I'd like to say a little about its author. J. Meade Falkner (1858-1932) was an Oxford-educated teacher who went into business, travelling the world and making a good deal of money before settling in Durham and devoting himself to a variety of leisure pursuits, including the study of ancient manuscripts. Perhaps because he seems to have packed so much else into his life, Falkner was a far from prolific writer, though he did range from verse and fiction to writing topographical guides. Although Moonfleet is by far his most famous book, The Lost Stradivarius is a notable ghost story. I don't know if Falkner and M.R. James were acquainted, but I'd like to think so. And then there is The Nebuly Coat, a really good Edwardian novel whose neglect I find baffling. Fellow Golden Age fans might like to know that it's said to have been an influence on Dorothy L. Sayers' The Nine Tailors. One of the most memorable scenes in Moonfleet - done very well in this version - is the candle auction. Candle auctions can be legally valid, and still take place occasionally - I recall once reading a learned article about them in The Law Society's Gazette. Falkner uses this and other plot devices to great effect and I felt that Ashley Pharoah made very good use of the excellent material. One of the best shows of Christmas. Is there any Golden Age novelist whose work is as fascinating and yet as frustrating as C. Daly King's? If so, I've yet to find him or her. My Forgotten Book for today is Arrogant Alibi, first published in 1939, and it's a case in point. Nowadays it's incredibly scarce. It took me years to track it down, and when eventually I got hold of a poor copy, I fell on it with delight. And there are some superb elements in the story. A terrible flood in the vicinity of the crime scene lends atmosphere, while Eygptology and a mysterious mummy and other ancient artefacts play a part in the story. There's lot of complex plot material concerning alibis and the apparent impossibility of certain events. There's a neat double twist ending. Michael Lord, the cop who stars in King's books, and his pal Dr L. Rees Pons are on the scene as well. What's not to like? The famous critics and Golden Age fans Barzun and Taylor really liked this book Since they could be very harsh judges, that's quite something. But I'm afraid I didn't get on with Arrogant Alibi. It's one thing to have all the right ingredients for a whodunit, quite another to make best use of them. And I'm afraid I felt that this is the sort of book that justifies people who don't like Golden Age novels in saying that they are boring. King spends pages, for instance, on explaining a telephone system that is connected to the storyline. I'm afraid this went so far beyond pleasingly authentic detail as to cause me to lose the will to live. And the characters didn't come to life at all as far as I was concerned. I wasn't expecting Sophie Hannah or Nicci French, but this wasn't even Freeman Wills Crofts. Because my hopes had been high, I ended the book feeling disappointed, but not surprised that Arrogant Alibi hasn't been reprinted, as far as I know, in the intervening years. Yet this experience simply reinforces my curiosity about King, and the way he could veer from excellence, for instance in Obelists Fly High and The Curious Mr Tarrant, to tedium (and Obelists En Route shows both his best and his worst sides.) Dorothy L. Sayers admired some of his work, and so do I. And if you are lucky enough to find a first edition of this book in a fine dust jacket, it will no doubt be a good investment, even if not the best whodunit you'll ever read! Death Comes to Pemberley, adapted from the novel by P.D.James, and BBC One's flagship crime show for Christmas, began this evening. Naturally, it boasts a glittering cast,including one of my favourite actors, Trevor Eve (I still mourn the premature demise of that excellent series of long ago, Shoestring). as well as the excellent Rebecca Front, whose very varied CV includes Lewis, and Jenna Coleman, seen yesterday evening in Doctor Who. Traditional Golden Age detective fiction, of which the admirable P.D. James is - perhaps alongside Colin Dexter - the greatest modern exponent, is often associated with country house settings, and a storyline which presents a sort of homicidal sequel to Pride and Prejudice was James' neat way of combining the country house backdrop with a historical mystery paying due homage to Jane Austen. She isn't, however, the first British crime writer to have made good use of Austen's work. The late Reginald Hill wrote a notable story inspired by Emma, a book which he argued had many of the attributes of a detective novel. This first episode of three began enigmatically, in the grounds of the Darcys' mansion. Two young women servants walking in the woods become frightened and claim to have seen a ghost, although we do not learn for some time the legend behind the apparition, or that it is (surprise, surprise!) supposed to be the precursor of misfortune. After this promising opening, though, the focus was for a long time rather more on pastiche Austen than on mysterious murder, and there were moments when I found myself wondering when the detective work was likely to get going. Things did, however, start to warm up when, after shots were heard, a man was found dead in the grounds of the house. A local magistrate (Eve, in terrific form) was duly called in, and the credits rolled as the obvious suspect was driven away for further questioning while protesting his innocence. We can, of course, be sure that there is more to this crime than meets the eye. How much more, I don't know, because this is one of only a couple of James' books that I haven't read. But I'm looking forward to finding out..
Well, then, what did Santa bring you? I am now the happy owner of Darryl Jones' edition of M.R. James' Collected Ghost Stories, and this acquisition coincided with a Christmas Day James-fest on BBC Two. Mark Gatiss wrote and directed an adaptation of The Tractate Middoth, and then presented an excellent documentary about James' life and work. The Tractate Middoth is not one of James' most famous tales, even though it combines an atmospheric library setting with a malevolent testator of the kind often found in Golden Age detective fiction. I've always had a soft spot for fiction dealing with mysterious wills - so much so that I'm not sure why I haven't written more myself. As for.James' story, it has to be said, suffers from a central flaw - reliance on a huge coincidence. One question in my mind was how Gatiss would address this. His approach was not to tinker with that part of the plot, although he did jazz things up by changing the period in which the story was set - an initial scene in the 30s preceded the events of the main story taking place in the 50s. Viewers were distracted from the coincidence by the inclusion of small but engaging parts for several well-known and likeable actors - Eleanor Bron, Roy Barraclough and Una Stubbs. David Ryall played the wonderfully named Rant, while John Castle was as intense and sinister as ever as one of Rant's hopeful heirs. Gatiss's method worked pretty well, though a more daring attempt to explain more plausibly how the young librarian happened to come across the one other person desperately seeking a book to be found in his library would have been welcome. The Tractate Middoth does not rank as an absolute masterpiece, either as prose or as television but nevertheless supplies good light entertainment in both media. I really enjoyed Gatiss's study of James, whose sheltered life in Eton and Cambridge was one of comfort and privilege. Like so many other Victorian writers, though (Conan Doyle, Bram Stoker, and Stevenson are obvious examples) he was prey to dark imaginings, and although he was far from prolific, he produced ghost stories once or twice a year from the late nineteenth century until not long before his death in the 30s. Gatiss even discovered a charming old man who had known James at the end of his life, and liked and admired him. A fascinating man and writer, and having read his stories from time to time in anthologies for many years, I look forward to reading his collected works. This is the right time of year for ghost stories, a genre I've always enjoyed. Last year saw the publication of my first ghost story, "No Flowers", and I'm tempted to write another before long. I'm also very much looking forward to seeing a new M.R. James adaptation and documentary, to be screened on the BBC on Christmas.Day. Reviews will be forthcoming! Whilst in the mood for ghosts, I invited AK Benedict, who is not only a fan of the genre but an expert in it, to contribute a post to this blog. Alexandra is one of the most interesting and evocative new writers to have emerged in the last year or two, and her characteristically witty and thoughtful response delighted me. Here it is. It is December 21st, the winter solstice, and I am gathering ghost stories like logs in a forest that will blaze in the telling and see me through the longest night. Ghost stories don’t sit well with summer: shadows are skimpy, days are long and spectres are rarely seen licking a Mr Whippy but now, in deepest December, when the wind slaps leaves on windows like parking tickets and the sun packs up early and slopes off to the pub, they are perfect. The dark brings fear and uncertainty – we don’t know what lurks in the shadow in the cupboard at the bottom of the stairs. Ghost stories let fear out of the cupboard and allow it to run around the house before locking it back in again, worn out for now. Much like the crime novel, the spooky story acknowledges and exorcises darkness, if only until the fire dies out. I’ve loved reading ghost stories in winter since I was a child, from Dickens’ ‘The Signalman’ to Lefcadio Hearn’s retelling of the Japanese supernatural tale ‘The Boy who Drew Cats’. The latter’s haunting advice: “at night, when in large spaces, keep to small” once had me sleeping on the floor of my wardrobe for all of Christmas week. Reading stories of spirits at this time of year is a tradition that goes back to the winter’s tale spoken of by Marlowe and Prince Mamillius in Shakespeare’s own A Winter’s Tale who states that ‘a sad tale’s best for winter: I have one/ of sprites and goblins’. In 1820 Washington Irving wrote of ‘strange accounts of popular superstitions and legends’ told by the fireside on Christmas day; Dickens popularised the ghost story as a yuletide activity in The Pickwick Papers, A Christmas Carol, ‘The Haunted Man and the Ghost’s Bargain and other stories and Henry James brilliant ‘The Turn of the Screw’ is presented as a ghost story told at Christmas by the narrator. Montague Rhodes James, provost of King’s College, Cambridge, read his ghost stories to his friends in the Chitchat Society on Christmas Eve. His stories begin in casual, conversational style with dry humour and a clear sense of place; his protagonists are men (always men!) of reason, curiosity and scholarship who, like in LeFanu and Lovecraft, end up knowing less about the world than when they started. Rationality is powerless when up against ‘a horrible, intensely horrible face of crumpled linen’ (‘O Whistle and I’ll Come to you, my Lad’) or ‘pale, dusty skin, covering nothing but bones and tendons of appalling strength; coarse black hairs longer than ever grew on a human hand’ (‘Canon Alberic’s scrapbook’). M R James was the reason I applied to King’s College and it was only when I got in, and sat in the dining hall beneath the stern gaze of his portrait, that I found out that he had obstructed degrees for women. Sometimes, what you most fear comes to pass, and no ghost story will stop them. I will be inside on Christmas Eve, wine mulling, chestnuts burning, candles shivering, and reading from my pile of M R James, Sheridan La Fanu, E F Benson, Ambrose Pierce, E Nesbit, May Sinclair, Charles Dickens and Henry James. I will probably eat my body weight in mince pies at the same time, knowing that the sun will come back from the bar soon with a packet of nuts and a tale to tell. Meanwhile, sitting in a shadow-licked room, reading ghosts stories out loud, is a way of knowing that I’m not dead. Yet." Never Coming Back is the first thriller by Tim Weaver that I've read, and I came to it fresh, not knowing anything about either the author or his protagonist, an investigator called David Raker who specialises in finding missing people. It is, you might say, an "airport thriller", a chunky holiday read. But to say that is not to damn it with faint praise. I thought Weaver did a good job, and I'm not surprised the book is evidently selling very well. I'll be very glad to read more of his books. The central mystery is: what happened to a family of four which disappeared from home one evening, never to return? There was no obvious reason why Paul, Carrie and their two daughters should suddenly vanish from sight. But Emily Kane, an old flame of Raker's, is Carrie's sister, and she wants him to find the answer. We are also presented with a couple of other puzzles, one dating back to a visit Raker paid to Las Vegas, and one concerning the discovery of a man's remains on a beach. Naturally, they all prove to be connected. One of the things that appealed to me about Tim Weaver's book is that here is a writer setting his fiction in Britain, yet trying to compete with the likes of Harlan Coben and Lee Child, who take advantage of the much wider geographical canvas presented by the United States. Weaver displays considerable skill in the way he structures his puzzle, and I particularly liked his use of a "lost village", one of those mysterious places that always seem so fascinating. As is sometimes the case with modern American thrillers, there was a touch of sentimentality in the story, especially arising from the final unexpected twist, but this didn't lessen my enjoyment. Of course, Weaver piles on the coincidences, and the central device, which involves a photograph, struck me as a little far-fetched. but by and large, I think he gets away with it. The pace and verve of the narrative swept me along. 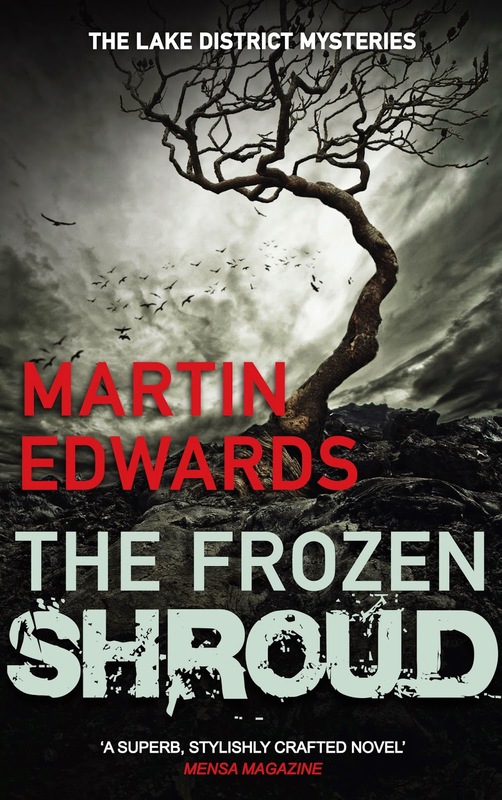 A good thriller, then, and an author's name to bear in mind. Especially if you're off on holiday and are in search of some enjoyable light entertainment. Two notable crime dramas came to an end this week. The Tunnel and Lucan were very different, and in fact illustrate well the range of crime drama. The tenth and final episode of The Tunnel was at times slower-paced than the sometimes frenetic earlier episodes, but it continued to grip me to the end, and the decision to avoid the obvious happy ending struck me as a sound one. The performance of Stephen Dillane, as the cop whose character flaws had, though he didn't realise it for a long time, set in motion the events that led to the exploits of the "Truth Terrorist" was superb - what a fine actor he is. The convoluted plot required suspension of disbelief on a massive scale, but the storyline did have a crazy logic, and it worked for me, despite innumerable implausibilities. Because of the wildness of the story, I didn't find The Tunnel quite as affecting as Broadchurch, which I thought the best crime drama of the year (so far) but it was still very powerful.. I wasn't sure whether the decision to spin out Lucan to three hours was a good one, but it's a tribute to both Jeff Pope, the scriptwriter, and the excellent cast that it worked, and I didn't lose interest during the second and concluding part of the story. Who knows what Lord Lucan's precise fate was - in this version, he was thrown off a ship when his continued existence became an embarrassment to his posh friends. It can safely be said that he was no great loss, but above all I felt sorry for the parents of the luckless nanny who was killed simply because she was in the wrong place at the wrong time. As they said in the screenplay, despite all the fuss about Lucan and his circle, it is wrong for her to be forgotten. Philip Macdonald was one of the major British crime writers of the Golden Age, and given that he also enjoyed much success as a Hollywood screenwriter, it is surprising to me that his work is not discussed more extensively. I've always liked his work, while recognising that his inventiveness was matched by a certain haste and carelessness that sometimes meant his books fell short of the high standards of which he was capable. Today's Forgotten Book, The Wraith, is an example of both his gifts and his shortcomings. The book was published in 1931, and my paperback reprint makes the very bold claim that "Colonel Anthony Gethryn is no longer merely an extremely engaging character, he has become a permanent figure in crime fiction." Well, perhaps not, but he was one of the more appealing Golden Age detectives in my opinion. Here he tells the story himself, years after the events took place. It's a good device, and Macdonald handles it pretty well. The setting is a small Fenland village in the aftermath of the Great War. Gethryn is staying there, and is invited to dinner at the local mansion. His host is duly murdered, and there is, as usual, a small circle of potential suspects, one of them rather wraith-like. The set-up is excellent, and there is an excellent twist, which is the most effective part of the story and was probably the idea that sparked the novel. The downside is that there are too few suspects, and they are too thinly characterised. For this book to have become a classic, Macdonald would have needed to put more effort into building up the tension and background as well as the people of High Fen. As it is, The Wraith feels, in parts, almost as insubstantial as that eponymous ghostly figure. But it's a reminder of Macdonald's talents, and a book which certainly benefits from his crisp and readable style. And many years later, it was referenced by Desmond Cory in an even more intriguing book, Bennett. In Their Skin is a film from last year, a creepy thriller that plays on our fears about having our home territory invaded. After a mysterious shooting in the open scene, a married couple with an eight year old son drive to an upmarket holiday home in the middle of nowhere. All is not well between Mark (Josh Close) and Mary (Selma Blair) but we don't fully understand why at first. They are woken early by neighbours, a family of three whose behaviour is odd from the outset. At this point, I'd have been running for cover, but Mark invites Bobby (James D'Arcy) and Jane (Rachel Milner) and their son for a meal. Big mistake, needless to say. Things remain enigmatic for a while, but when the visiting boy pulls a knife on his young playmate, prompting Mark to ask his visitors to leave, mayhem ensues. The second part of the film is conventional for the most part, with one or two unexpected sequences, as things go from bad to worse as far as Mark and Mary are concerned. Bobby is crazy, of course, and Jane is not as nice as she seems. Of course, there is an air of predictability about films which follow this pattern, but on the whole I felt that tension was maintained very well, and Selma Blair in particular is very good. The script attempts to add a layer of meaning, in effect by pitting a bunch of weird people against a family which seems to have everything but really is far from perfect. I didn't think this aspect of the film worked too well, partly because we didn't care enough (or know enough) about the characters' lives and partly because it takes exceptional writing to turn a thriller like this into something deep and meaningful. In Their Skin is best regarded as entertainment, pure and simple, and if you like this sort of thing, it passes the time very well. Why haven't I made the rapid progress with the next Lake District Mystery that I intended a few months ago? Well, my tardiness is a cause for regret, of course, but I can come up with a few excuses. Among them are a number of other writing projects that I've felt the urge to squeeze in. These include writing two more book introductions - more details of these soon. I was also pleased to be asked to contribute to a collection of essays called Morphologies. The sub-title is "short story writers on short stories", though it's fair to say that most if not all of the contributors are best known for their novels. A large part of the attraction of accepting the commission was the glittering list of fellow contributors - it includes notable writers such as Frank Cottrell Boyce, Ramsey Campbell, Toby Litt, Sara Maitland, and Jane Rogers Who would not want to be in such company? . One of the other contributors was Brian Aldiss. Now I've never met him, but I have a vivid memory of attending a talk about writing given at the Oxford Union almost forty years ago, when I was a student, dreaming of one day publishing a novel. The other speakers, if memory serves, included Kingsley Amis, John Braine, Angus Wilson and Thomas Hinde. However, to be brutally honest, the only one who struck me as a remotely viable role model was Brian Aldiss. The others were not, I felt, at their best - which was disappointing as this was the first event featuring a number of leading novelists that I'd ever attended in my life. So I'm glad to have this slender literary connection with Mr Aldiss. If you'd told me it would happen when I was a student, I would have been absolutely thrilled. Anyway, I digress. The (very nicely produced) book is published by Comma Press, and edited by Ra Page, who provides a good introduction.. Authors covered include Kafka, D.H. Lawrence, Kipling, Poe, Hawthorne and Dostoyevsky. My subject was Conan Doyle's short stories, but I did not by any means confine myself to Sherlock. Conan Doyle wrote some excellent stories about other characters, and I find some of his horror stories highly effective - for instance, "The Case of Lady Sannox." It was, admittedly, time-consuming researching and writing the essay, but I'm proud to be part of this fascinatinag project. Lucan is a two-part ITV programme about one of the most renowned murder cases of the Seventies and I've just caught up with the first part. Nobody has ever been put on trial for the murder of the Lucan family nanny, Sandra Rivett, but Lord Lucan's disappearance meant that he has always been prime suspect. And the makers of this programme made it clear that they considered him guilty. Unjust? Well, Lucan was, by all accounts, a vile man. The great mystery is what happened to him after the killing. This version of the story is based on a book by John Pearson, and follows his attempts to find out about the closed circle of rich men who were members of Lucan's clique at the Clermont Club, where he gambled away the family fortune. Pearson is played by the always impressive Paul Freeman. Lucan, as played by Rory Kinnear, is not just posh and rich, but vicious and very, very stupid. The other main villain of the story is the weird John Aspinall, played with his customary excellence by Christopher Ecclestone, who exploits Lucan, and eggs him on to dark deeds. He also appears to be an advocate of eugenics. The rich are different, we are often told. Not in a good way, though, if Lucan is any guide. The murder of Sandra Rivett, a poor woman who was just in the wrong place at the wrong time, was a repellent crime committed by a repellent person. In fact, the main weakness of this well made and well cast programme was that it took ninety minutes to tell a depressingly straightforward story. I shall watch the second part, in the hope of a credible explanation for Lucan's fate. Is he still alive? I can't imagine it. You'd surely have to be much more intelligent than Lucan to evade attention for forty years. One of the reasons why stories like the Lucan case appeal so widely, of course, is that most people have an instinctive desire to believe that wealth does not equate to happiness. Lucan certainly supports this view, but there is a legitimate question as to whether it is right to dramatise the case when some of the innocent people involved are still alive. It must be painful for Lady Lucan and her children, and the story makes it clear that she and they deserve sympathy. But after forty years, surely it's fair enough to make a programme about the case, provided every attempt is made to stick to the facts. I was encouraged to read today's Forgotten Book by an interesting post in that excellent blog Beneath the Stains of Time. Follow, as the Night..., also known as Your Loving Victim (a title that verges on a spoiler) was published by Patricia McGerr in 1951. Three years later, it was made into a film in France, the English title being One Step to Eternity. Sadly, there does not seem to be any DVD version on the market. If I could find a copy, I'd certainly want to watch it. I say 'sadly' because this is a story that I found very enjoyable. As with McGerr's earlier books, notably Pick Your Victim, this is a "whowasdunin" type of story. At the outset, someone plunges from a balcony to their death. We then learn that a newspaper columnist, Larry Rock, invited the four women in his life to a party, intending to kill one of them. But which person did he have in mind to kill? The story is essentially told in flashback, as we see how Larry met and then messed about his first wife, his second, his mistress and the girl he now plans to marry. Why would he wish to kill any one of them in particular? We soon see that Larry is a very nasty piece of work indeed, while some of the women aren't much better, though one of them is decent and likeable. Very early on in this book, I asked myself how I would have tackled such a story if I'd had the same scenario idea as McGerr. I came up with an idea for a plot twist, and then set about trying to figure out an appropriate murder motive. By using this method, I did manage to anticipate what was going to happen, but it didn't spoil my enjoyment in any way. This is a short, snappy novel and it kept me entertained. No question in my mind, McGerr was a talented and inventive writer. It's taken me a while to get round to reading Gillian Flynn's massively successful best-seller Gone Girl, but I was finally prompted to do so when it was chosen by my firm's book group as our book of the month. And the first thing to say is that I can certainly see what all the fuss has been about. I read Flynn's excellent debut novel, Sharp Objects, and this story, although very different, is even more compelling. Flynn has written a psychological suspense novel with a story told from (at least) two different perspectives, a man called Nick Elliott, and his wife Amy. The subject matter is their complex relationship, and a sequence of disastrous events which spirals out of control. There's a major twist half way through the book, and I must say that I was pleased to recognise it as a device that was also used, although in a different way, by two Golden Age books that I've covered on this blog in the past year - one by Richard Hull and one by Nicholas Blake. To say any more would be a spoiler, but I am sure Flynn won't have read Hull's very obscure book, and is probably unlikely to have read the Blake In any case, her use of the device is different and distinctive. There are as many twists and turns as you'd find in a classic whodunit, and this is part of the book's appeal. The personalities of Nick and Amy are, in many ways, unappealing, but that is often the case with characters in books of this kind, and for me it was not an obstacle to enjoyment. There are also plenty of witty lines, as well as a withering portrayal of the way the media treat a cause celebre. I know some people, including my colleagues at work, found the ending of the book unsatisfactory. Since I am not, of course, going to give anything away about what happens, I will simply say that I agree that the quality of the ending was not in my opinion quite up to the standard of the rest of the book. But I could see what Gillian Flynn was trying to do (although in the lead-up to the finale, I thought she had a different outcome in mind). Some of my colleagues gave it lowish marks (I've begged them not to subject my own novels to their very demanding scrutiny! ), but I rate it highly. Overall I must say that for me, this novel lives up to all the hype. 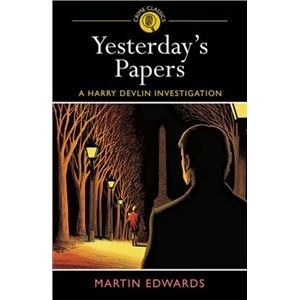 This week sees the publication of Yesterday's Papers, my fourth Harry Devlin novel, as an Arcturus Crime Classic, not quite twenty years after its first appearance. Unusually, the book has been published by three different publishers as a mass market paperback over the years (there is also an ebook version with a wonderful intro by Peter Lovesey, as well as a paperback print on demand version.) Originally the publisher was Bantam. Later, when I moved publishers to Hodder, they reprinted the earlier titles including this one. It's also, in a way, a "cold case" story that anticipates elements of my Lake District Mysteries. I'm especially gratified because this is a book for which I've always had a soft spot. If pushed, I'd say it's probably my personal favourite among the Devlin titles. I'm not one of those authors who disowns his earlier books, or feels unduly embarrassed about them - even though I'm the first to admit that I'd write them differently (in some respects) if I were writing them today. I must say that it's rare for me to re-read my earlier work, though I do have to do so occasionally (for instance, when checking proofs of new versions or checking facts for an article.) But the early books provide, in some ways, a snapshot of ideas and issues that were interesting me or concerning me at the time I wrote them. That's true of most novels, of course, and it's one of the reasons I find it so fascinating to investigate books of the past. They cast a light on the times when they were written, even if the author didn't intend to do so. The story of my career as a writer is illustrated (or so I might think in darker moments0 by the story of Yesterday's Papers. I felt it was the most successful book I'd written to date, with lots of twists and quite a bit of humour, as well as a glance at the era of the Mersey Sound in Liverpool during the Sixties. Bantam had tried to promote me by pricing the books very competitively. But it didn't result in mega-sales, and a complication was that I had a separate hardback publisher, Piatkus. Yesterday's Papers, however, earned numerous glowing reviews in Britain and elsewhere, and was even one of only a couple or so of crime novels featured in The Sunday Times Paperbacks of the Year. I dreamed that this would boost sales - only to be told that Bantam had already decided not to publish me any more. A shame, because they are a top publisher, and I had a really nice editor, Francesca Liversidge. But these things happen in a writer's career, and one of the most corrosive emotions is self-pity. Frustrating as the writing life can be, it's also a great life. You have to get on and make the most of it. And before long, as I say, another good publisher, Hodder, and an excellent editor, Kate Lyall Grant, came along..
Against this background, the revival of Yesterday's Papers is really rather a Christmas treat for me. I still think the plot-lines are among the best I've managed to come up with. And I'm hoping that a new group of readers will enjoy discovering Harry Devlin, and will be entertained by a story that reaches back to a time when the songs of Liverpool were being sung the world over. Why Re-Read a Detective Story? What is the point of re-reading a detective story? After all, if you know whodunit, surely it's a waste of time? This is an argument I've come across a good many times over the years. And there are certainly plenty of detective stories that most readers may doubt were worth reading once, let alone twice. (Mind you, that's true of plenty of books outside the crime genre, as well.) But I think a great deal of pleasure may be gained from re-reading a good whodunit, even if you can still remember who committed the crime and why. A case in point is Death Walks in Eastrepps by Francis Beeding. I first read this novel in my twenties, but it has stuck in my mind ever since, and its reappearance as an Arcturus Crime Classic prompted me to give it another go. I knew the identity of the surprise culprit, and the even more surprising motive, but I was interested to see how the two authors who co-wrote under the Beeding name handled their tricky plot. In this book, as in their The Norwich Victims, which I also re-read recently, they shift scenes and viewpoints regularly, giving the story a filmic quality. (Unsurprisingly, Alfred Hitchcock adapted another of their novels, which became Spellbound.) Even by today's frenetic standards, the book does not lack pace. It's an early serial killer novel, and there are half a dozen victims, before the culprit (or apparent culprit) is finally tracked down - after the original prime suspect had turned out to be innocent, if deranged. There is a good courtroom sequence before a series of short and snappy scenes lead up to the final dramatic revelation. I was impressed by the way Beeding orchestrated a complicated storyline, and admiration of authorial craft is in itself a good reason to give a book a second reading. There are so many books I'll never read even once that I suppose I ought to feel guilty about spending time on a story I remembered pretty well. But I don't regret it at all, because I found it just as enjoyable the second time around as the first. Do you know the work of Pamela Barrington? I didn't until recently. But I have now read her 1968 novel Accessory to Murder, and really enjoyed it. What is more, I would not have come across either Barrington or her Forgotten Book had it not been for one of the knowledgeable readers of this blog. Kacper contacted me a while ago and suggested I might be interested in Barrington. He said he'd been impressed with some of her work and thought I might like it too. He was quite right, and I'm really grateful to him for pointing me in her direction. This little anecdote is an example, of course, of one of the very happy consequences of blogging. As a result of my posts here, I've come into contact with a wide range of people - some of whom I've been able to meet in person, many of whom I haven't - who have certainly proved delightful to talk to, either face to face or via email. And I've learned a good deal from these contacts, as well as benefiting from many kindnesses. It never ceases to amaze me how wonderfully the internet - whatever people say about its shortcomings- has opened up new horizons for us all. Anyway, back to Barrington - whose real name, Kacper tells me, was Muriel Vere Mant Barling. She wrote about two dozen novels, with this one coming at the end of her career. It's a fast moving story, which opens with a man called Henry Deek, who seizes the chance to blackmail a rich local woman when he discovers a missing will. A legal point cropped up concerning the will, which I thought would be relevant, but was never mentioned again - one of the few flaws in an otherwise neatly constructed story. When Henry is found murdered, there are a number of potential suspects, and Barrington does a good job of switching suspicion around. The twist at the end was, I felt, a bit weak, but all in all this was a lively and entertaining book. It reminded me of some of Margaret Yorke's early stand-alone crime novels. Margaret, of course, went on to win the CWA Diamond Dagger, whereas Barrington is now neglected. But as Kacper rightly said, she does not deserve to be. Incidentally, just as I was about to post here, Kacper has emailed me again with fresh information about Barrington (including the fact that she was born in Cheshire,which gives me a certain fellow feeling for her), and I hope to feature her again in this blog before too long. My blog about P.D. James' essay on the legendary Wallace case prompted some very interesting comments and emails. One of them came from Alan Hamilton, who has just written a novel, Stalemate, which draws on the case (and which I very much look forward to reading.) Alan's research has been impressive, and I invited him to contribute a guest blog setting out some of his thoughts, which I hope will also whet readers' appetites for his novel. We know that at the time of the murder Wallace was terminally ill. He’d spent a month as an in-patient in a Liverpool hospital in mid-1930 and had it made clear to him that his remaining kidney was diseased and malfunctioning and that nothing could be done to reverse or even arrest that. We also know he was a deeply introspective, introverted, and cerebral man. Wholly self-taught, his interests covered chemistry, science in general, philosophy, chess, music, and literature – interests that, together with his psychological traits, tended to cut him off from those among whom he lived and worked. We know, and this knowledge is only about fifteen years old, that Julia Wallace was nearly twenty years older than her husband and yet had got away with claiming to be the same age as him. No one at the time suspected it. She did not look her age. She had lied persistently on official documents about her age, parentage, place of birth and even her first name, and did so too with her marriage certificate. We know she rented and did not own the house she lived in when she met Wallace. We know she had today’s equivalent of £2340 in her Post Office account and on the night she was killed about £40 in cash in a pocket applied to the inside of her corset. She would have had to undress to get at the money. We know that when Wallace arrived home from his wasted trip to Mossley Hill in pursuit of business from Mr Qualtrough, he was able to enter his back yard through the door in the wall. He said he’d told his wife to bolt it after him. If she had, he wouldn’t have been able, or expected, to get in. We know that Julia was killed around 8pm. Professor McFall wrote that in the first report he made to the CID. He later changed his mind although he had no better evidence than he had had when he made that first report. And finally we know that, contrary to PD James’s theory, Wallace did not cost Parry his job by reporting him to the Pru for paying-in less than he collected. It was more than a year after Wallace caught Parry out that Parry left the Pru of his own accord. About a month before the murder, Parry gave Wallace a calendar from his new employer. It was Wallace’s supervisor who told him later that Parry’s father had made good shortages in his son’s accounts. So, given what we know, what might have happened? Someone killed Julia and with a degree of violence of which Wallace, given his temperament and physical condition, was probably incapable. What’s more, whoever it was did it when Wallace was several miles from home. Someone who was let into the house by Julia; someone she either knew or thought she knew. Someone who intended from the start, or was provoked, to kill her. Someone from her distinctly strange past, perhaps, or someone who wanted her out of the way? Or someone who was persuaded, rewarded, or pressured to kill her so someone else could benefit? Someone else who might then feel that at the end of a lifetime of frustration and disappointment he (or she) had organised ‘the perfect murder’". In real life,and in fiction, doctors have a disturbing track record when it comes to homicide. My own favourite medical murderer (or was he simply unlucky and much misunderstood?) is Dr Crippen, while the terrible crimes of Harold Shipman undoubtedly rank among the most chilling murders Britain has ever experienced. Detective novelists have often featured doctors as culprits (as I myself have done.) Accountants and even rascally lawyers seem to get off relatively lightly in comparison. Why is this? One reason, perhaps, is the trust that we place in members of the medical profession, and the fear we have that in certain circumstances that trust might be betrayed - though I hasten to add that every single doctor I've ever met in person has struck me as decent and caring. This mix of trust and fear underpins a 2011 movie, The Good Doctor. Orlando Bloom plays Martin Blake, a young and rather lonely British guy who has moved to the States to pursue a medical career. He treats a very pretty young woman, and is soon tempted into behaving appallingly in order to maintain his connection with her. She is played by Riley Keough, who is the grand-daughter of Elvis Presley, no less. Needless to say, things do not turn out as Blake had planned, and there's some uncomfortable watching in the hospital scenes for any hypochondriac. The prime requirement of a story of psychological suspense, though, is that it must be psychologically convincing. The script simply doesn't tell us enough about Blake's personal history to make us empathise with or really understand him, and I felt this was a major flaw. As a result, the film frustrated me. It had the potential to be gripping, but eventually I became not only queasy but restless, and the final scenes struck me as artistically unsatisfactory. In fairness, I should add that The Good Doctor has had some positive reviews, but there is something cold about it that I am afraid I found rather unappealing. I've just returned from a week away - and a week away from internet access, other than a five minute window which just gave me the chance to publish the comments several of you had kindly made on posts I'd scheduled to appear in my absence. A week without emails - that's the first time I've been so out of touch (well, in terms of technology, anyway) since the mid 90s. It was certainly an eventful week. The plan was to go on a cruise focusing on the Azores. I'd never been there, but a late impulse decision to give the little islands a go was thwarted within an hour of stepping on board ship. The weather forecast was appalling, and the news was that we would be unable to dock. Very sensibly, the captain changed the itinerary, and apart from one day of rough seas, the weather was fantastic. So despite the disappointment of missing out on the Azores, it all worked out for the best. And by a pleasing coincidence, the very first song in the first night's evening show was "Magical Mystery Tour". Mind you, within hours of returning, I had a phone call from a crime writing friend, Eileen Dewhurst, who broke the news that she'd actually made it to the Azores a week earlier - and loved them. So I'll have to give them another try one day. And when I finally had the chance to skim through my emails, I was delighted to read one notifying me of acceptance of a new short story for a very interesting-sounding international crime anthology, commissioned as a result of my involvement in the international writers' conference at Oxford back in August. During my unexpectedly Azores-less and internet-less week, I did find plenty of time both to read and to think about my new Lakes book. Work on this has been delayed for various reasons, but I enjoyed having the chance to think out my characters in more detail and I hope to get cracking again any day now. As for reading, the books were chosen for variety, and did not disappoint (except for one surprisingly weak Patrick Quentin.) More of them in future blog posts. The revised itinerary took in La Palma, Madeira, Rabat and Lanzarote, and I became fascinated by the volcanic nature of the Canaries. This has prompted a new idea for a short story, although I only have the idea rather than the detail of the storyline at present. And among other things, I went for a ride on a camel. Photographic evidence of this does exist, but I don't think the internet is yet ready for the pictures! However, here are some of the other sights that I found so appealing. The kasbah in the imperial city of Rabat, a much more fascinating place, in my opinion, than the port where we landed, Casablanca. Morocco is a remarkable country, which I've now visited (although quite briefly) five times in the past couple of years, and one of the things that has impressed me most about it is the way that Muslims, Christians and Jews appear to live in harmony. The volcanic area of the national park in Lanzarote. The geysers of Fire Mountain, and the restaurant where food is cooked by the heat of the volcano are truly extraordinary. And finally, the stunning lunar landscape near Mount Teide in Tenerife. The first Planet of the Apes movie was filmed here, and no wonder. The beach resorts of the island hold no great appeal for me, but Tenerife's dramatic scenery is worth travelling a long way to see.